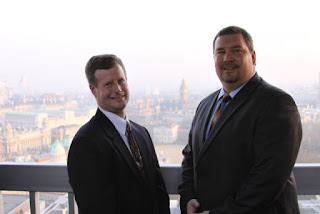 Last week I did an interview with Jeremiah Karpowicz for Commercial UAV News and he did a good job. Here is the link to Part 1 of the interview. Do You Want to Drone in Agriculture? A couple of months ago I was participating at the Drone World Expo (DWE) www.droneworldexpo.com as a speaker, town hall panelist, and DWE Advisory Board member. Over 2,100 people attended this event. There was a nice little trade show but more importantly presentations from some of the national leaders in Unmanned Air Systems (UAS) use, applications, regulations, and such. UAS for firefighting, UAS for maritime use, UAS for building inspection, etc. were just a few of the topics covered. Mine was on agriculture. 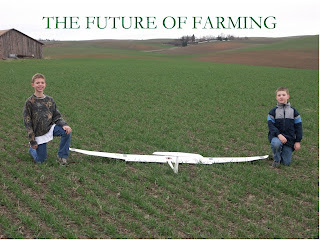 Agriculture has been tabbed by many as the largest market for commercial UAS application. However, during my national and international travels speaking, exhibiting, and learning I have found that those outside of production agriculture do not have a clue of the people in the marketspace or how to relate to them. What many see is a cash register sitting on a tractor. This can potentially be a recipe for disaster for creating a commercial UAS industry and/or company. Some of these same people trying to create a form of agriculture UAS startup are the same people that focus on buying “local” or are into “sustainable agriculture” or don’t like “factory farms” or hate “chemicals”. Or they take part in trendy fads such a gluten free, free range, cage free, grass fed, organic, or other marketing gimmick targeted against the industry I love. I’m not trying to tell everyone what to do, I’m just saying don’t talk bad about farmers with your mouth full! You have to realize that your actions, while seemingly innocent, directly affect the people you are wanting to receive money from. 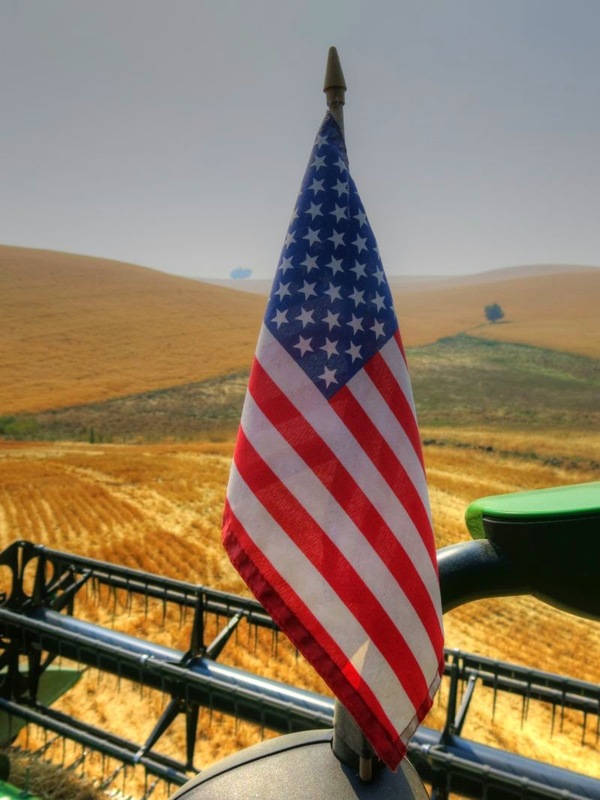 Farmers and ranchers aren’t just American Gothic (the picture of a man in overalls with a pitchfork with a woman in a dress with a white house in the background). Many are CEOs of multi-million dollar international businesses. That’s right! You see, much of what they produce is shipped overseas. You are dealing with C-suite executives that have a much better view than their urban counterparts and do more work for less pay. One farmer in four uses a smart phone and tablet. They also wear many different hats such as engineer, agronomist, soil scientist, veterinarian, heavy equipment operator, mechanic, carpenter, electrician, plumber, accountant, marketing specialist, and on and on. They usually know more about national and international politics than the average person…because their businesses depend upon the winds of political climates and good information. Don’t try to BS them…you definitely won’t pass the “sniff” test! They aren’t buying drones because it’s labeled for agriculture, they bought it because they love toys and it’s an extension of the childhood they never grew up from. Remember, they play in a huge “sandbox” with bigger Tonka Toys than you or they had in their youth. In my lifetime there have been two important technology advancements that were put on life support because people just wanted to make a buck and/or it wasn’t explained properly to the agriculture community. The first was LandSat in the 1970’s. This technology is the foundation on what UAS data is based upon. The commercial agriculture market didn’t start utilizing this type of information until the 1990’s and it’s still trying to catch on. Precision Ag and remote sensing markets have been gaining momentum since 2010 and UAS have been a part of that increase. Yield monitors and auto steering are now part of all combines and tractors instead of an option. But in looking at the timeline, it has taken a good 15 years for farmers and the agriculture industry to trust again technology and the companies that sell and service it. The infant commercial UAS industry and companies in them need to do a quick history lesson. While fifteen years is not that long in the scheme of things, it is roughly 1/3 of the working span of a farmer in agriculture and farmers have long memories. I was just a kid driving truck in my first harvest, but I can tell you what the weather was like in 1977 and every year since. So be very careful. Do not oversell your products or services to this very fragile market called agriculture. Move slowly and try to understand what it is they are wanting and needing. If you are able to do that, then you could have a very successful company in the agriculture industry. My family and I have been truly Blessed with a crazy life! For over 20 years there have been ups and downs like most families have. In those 20 years we've had two great sons Dillon & Logan, lived and worked on a farm, and Rhonda surviving breast cancer. Crazily Blessed! However, nothing is as crazy as UAVs to UAS to Drones! Looking back, the journey actually started in the mid 1990's when I went back to the U of I to finish my degree at the nagging of Rhonda and it involves technology. Windows 95 came out and the best thing learned at college was the use of computers along with Word, Excel, Outlook, and PowerPoint. I remember thinking, why in the heck do I need email? At that time I believed in face to face, telephone, and then letter in that order for communication. It's definitely not like that any more...email is definitely the leader. OK, possibly FaceBook. Also, John Deere came out with their precision ag equipment and software called GreenStar. I bought a John Deere book on precision agriculture that showed an AgLeader yield monitor in the combine cab. This was truly the early days of precision agriculture. And dad said no to GreenStar..."Why would anyone want that junk?" Not long after, dad made the courageous decision to buy "bag phones" through our local co-op. This was for mom and Rhonda to have security in case something happened. However, they were commandeered by dad and I one spring and I couldn't keep him off of it when we were driving tractor. Today, I'm not separated much from my iPhone. Dad passed away in 2001 leaving a big hole in my heart and in our family. However, being Crazily Blessed it provided the opportunity to grow as a person. Prior to his passing I became a board member of the Idaho Grain Producers Association which opened a door to a much bigger world. Starting in 2003 I began the journey down the road of precision agriculture. I am now reminded of my age when I talk to younger people at events or giving presentations when I describe this time in my life. They don't know what a PDA is. They are more likely to know what an LP is versus a Personal Data Assistant...the precursor to smart phones. Yield monitors, auto-boom, and auto-steering followed. Direct support to make systems talk with each other was iffy at best. I learned what a "Dongle" is and it's not what you think. Cell phones and tech support became my friends. And in 2004 I flew in a small plane over my farm for the first time realizing images were the missing part for precision agriculture. I didn't know it at the time but this was called "remote sensing." And then I saw an advertisement in an agriculture magazine in 2006. Looking back it's both scary and exciting how that advertisement changed my life and my family's life forever. Crazily Blessed and I still have the magazine. The ad was for a UAV; Unmanned Aerial Vehicle. I purchased a unit and went to training. 2006 was also the start of being an exhibitor at trade shows. I went to two that fall and more the following spring. It was also the start of speaking around the country. Who would have thought that a single advertisement could change the life of a person and their family. Being gone from my family was bad enough, but what was worse was learning that you don't know what you don't know. I had to learn about aviation, cameras, remote sensing, FAA regulations, and more. I was on the bleeding edge of not only a new agriculture industry, but a new industry period. 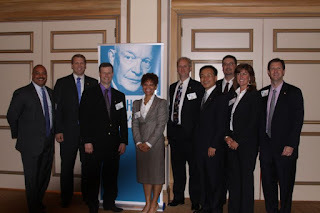 Nine of the 2011 U.S. Eisenhower Fellows at our "graduation"
Because of that one advertisement propelling me into the world of UAVs which changed to UAS in 2008 I was able to expand my world...literally. 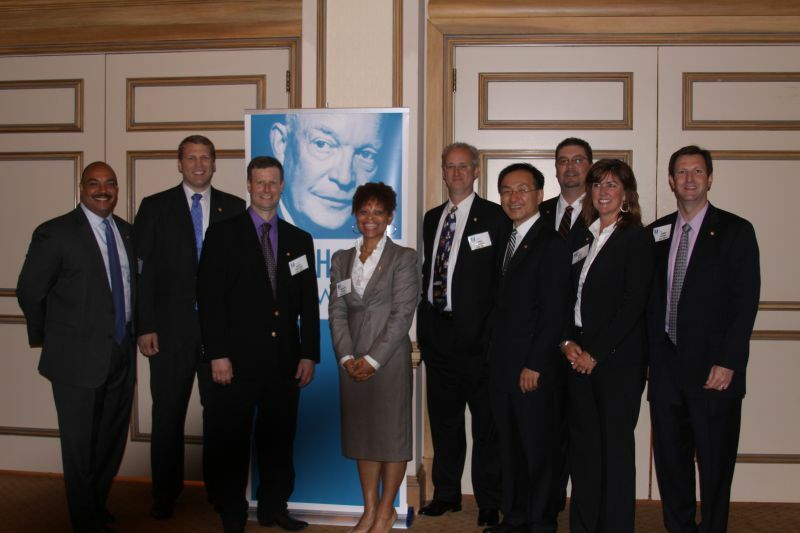 My work and advocacy of this new technology through 2010 helped me to be and Eisenhower Agriculture Fellow, a McCloy Agriculture Fellow, and be part of the Nuffield Scholars International. The friendships, connections, and knowledge gained from these outstanding organizations and the people in them helped change our family tree. Because of these great organizations, my family and I have had the opportunity to host people from around the world. 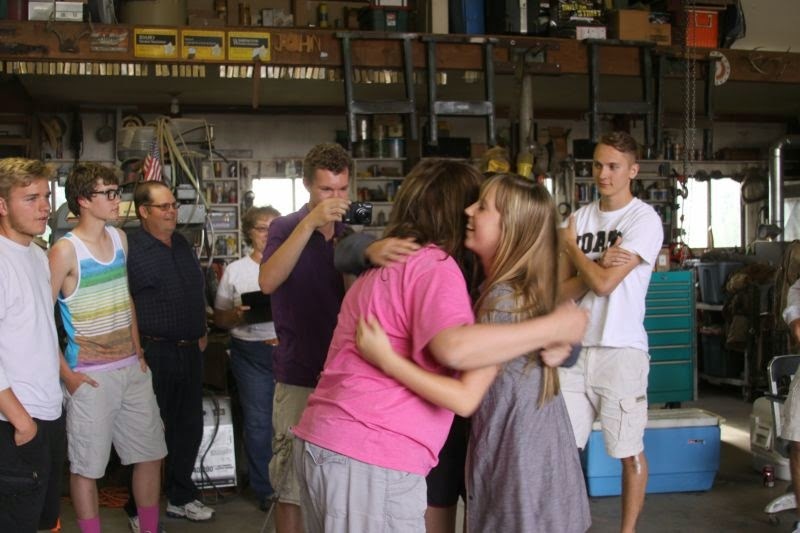 Dillon and Logan have been able to talk to farmers and people from other countries. While the countries might be different the people, especially farmers, have very similar experiences and stories. Also, these people are excelling at the highest levels of their profession whether its in agriculture, sports medicine, or being a district attorney. During one of the first of many conversations with Eisenhower Fellowships' agriculture mentor, Jim Moseley, I remember his words of wisdom to this day. The impact of that didn't hit home until after my fellowship travels; especially today. He said "Robert, you have just walked through a door that you can never walk through again." That door led to a bigger world of people, thoughts, and ideas. I cannot say thank you enough Jim for your wisdom, encouragement, and nudging. Besides my family joining in on several experiences and following my travels via FaceBook, emails, and Facetime, I had some PIC's in the journey. Rhett Proctor is my main accomplice. Rhett and I broke new ground by being the first multiple agriculture Eisenhower Fellows in one year and the first to attend the Nuffield Scholars annual gathering...The Contemporary Scholars Conference. Rhett made a leap of faith before I did. His family got out of their nationally renowned and championship dairy business. Rhett was transitioning from the farm to a life of being a veterinarian. I have followed his journey closely and we have talked when we can over the years since our EF travel days. I didn't realize it at the time, but his journey helped to lay the foundation for mine. 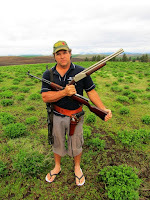 Another friend, Bryan Granshaw of Australia, Nuffield Scholar, and sugar cane farmer was another inspiration. We met in the Netherlands at the Nuffield Scholars CSC. Bryan also took the time on his journey of discovery to visit my farm in 2013. This year he had the courage to start a new career. Bryan is a "Soil Information Systems" products specialist at BMS Lasersat. Bryan and I have not had the chance to talk so I can ask him "Why did you want to chase your crazy dream based upon your travels, experiences, and knowledge of soils to leave the farm for another job?" I'll make sure Bryan is unarmed when I ask. Good on ya mate for that courage! Which leads me to today's long coming blog post and better explanation of the title. I am leaving my C-Sweet job of farming and replacing it with a C-Suite job of drones. I've sort of given up using the terms UAV & UAS. If you have read this far you followed my recap of my UAV journey; how it actually started when I went back to finish my degree, the drooling over GreenStar and a simple (and it was really small) advertisement. 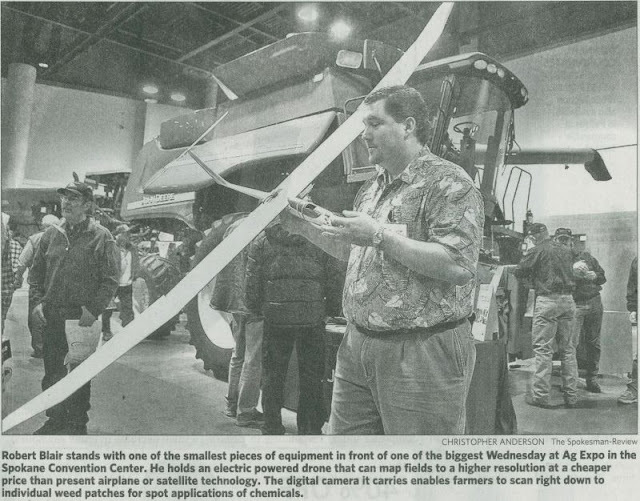 But what really kicked off my actual drone journey is a picture in the Spokesman Review in 2007 at the Spokane Ag Show. It's hard to believe I have been chasing this dream for almost 10 years. There have been family moments lost but national and global friends and knowledge gained. I am putting aside the security blanket of the farm for a new challenge and adventure of running the agriculture division (vertical) of a national drone service startup. My conversations with Rhonda, the boys, and my mom were nothing but supportive. A selfish reason for taking this job is to hopefully carry out my dream of creating a commercial UAV/UAS/Drone industry in the U.S. and agriculture. I also hope that my new position will help ensure that agriculture is served well, both as an enterprise and in rules. I'm not much into titles except for one...Farmer! I believe that is the most powerful title throughout the world. However, my new business title is VP of Agriculture for Measure Drones as a Service. This Friday capped off my second week on the job. I've been drinking from a fire hose trying to learn the company, the people, and what has been taking place prior to me joining. I'm Crazily Blessed that the fire hose is leaving my cup not just half full but overflowing with opportunity. I am extremely excited. I have much to learn and much to do before the 2016 crop season. I have prior obligations that need closing. I have been Crazily Blessed with a great support network of family, friends, and mentors. And I get to work from my C-Sweet office for my C-Suite job. The best of all worlds. From horses to drones. 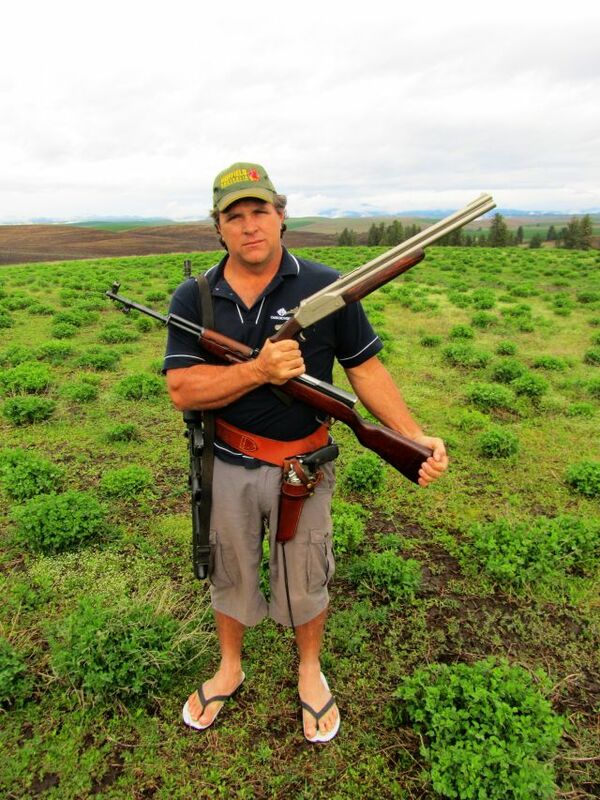 Idaho farmer Robert Blairtalks elks, surgical agriculture, and the future of farming. Top left: My grandfather Reinhard Wilken plowing with horses in the 1920s, Top right: Cletrac with a bean cultivator on front in the1930s, Middle right: My mother Marga Wilken Blair on a Farmall M cultivating beans in the 1950s, Bottom right: Robert Blair on a Case 2470 disking pea ground in the 1970s, Bottom left: Dillon Blair harrowing stubble ground with a John Deere 8520T in 2010, Middle: My son Logan Blair with a hexacopter in 2013. Image from Robert Blair. There are very few points in time when a person can help influence the future of an industry they love. Agriculture is my industry. Technology advancements such as John Deere’s plow, McCormick’s reaper, Eli Whitney’s cotton gin from the industrial revolution, and Norman Borlaug’s breeding techniques that started the green revolution, are the foundation of today’s agriculture. Today we are in the information age and Unmanned Air Systems (UAS) are another such advancement that can positively impact agriculture. The ability to capture information to help farmers and ranchers better understand their operations to make more informed management decisions is a reality. My precision agriculture journey began in 2003 by using a PDA (handeld digital device) with a wire connected to a small GPS receiver to do simple mapping. Now we use our smart phones with built in GPS and apps that are way more complex, user friendly, and functional to not only gather data but to control irrigation systems remotely. This has two pictures of the same thing; the one on the right is the original RGB image and the one on the left has had false color added to it to stand out. The white arrows are the same areas in each picture and point to a 45 foot wide block where the fertilizer machine was turned on/turned off properly. I used this for management/instruction purposes. The black arrows point to a steep area that is very shallow, rocky ground that doesn’t produce well no matter what management is done to it. The red circle shows an area where the dark green in the RGB corresponds to the light blue where nitrogen levels were good coming out of winter. The green, red, and dark blue in the image on the left corresponds with the yellow, light green, and brownish color on the right image where more nitrogen is needed. In 2004 I put a yield monitor onto the combine. It's made up of a computer in the cab with different sensors situated in and around the machine to collect elevation, temperature, crop moisture, on-the-go yield, etc. This is great information, but it is reactive data. That means the crop has matured to be harvested and there is nothing more I can do to affect the outcome of the growing season. I took precision agriculture to new heights in 2006 by becoming the first farmer in the US to own and use a UAS. Just like my early precision ag journey, there were many rocky roads to traverse and lessons to be learned. It’s tough being on the “bleeding” edge of industry. With the advancements of UAS and other agriculture technology we have surpassed precision agriculture and are now in the early stages of surgical agriculture. What I mean is, through advancements in technology we can do an even better job of managing our soils, crops, and other resources to more precise levels. Elk Damage in Peas – The arrows point to depression in the peas where elk laid down. You can also see the trails going all direction through the crop along with the seed rows of peas. UAS change the game drastically. They can collect data throughout the growing season so management decision can be made on when to water (I am a dryland farmer and rely strictly on rain), fertilizer needs in certain areas, weed problems that need to be treated, or other anomalies that show up. The best part is that I now have coordinates to physically check targeted areas, and this makes better use of my time. However, a UAS is only as good as the other precision ag equipment on the farm. If there are no computers on the tractors or controllers on the equipment, the UAS data collected is just good general information with no directed purpose…pretty pictures. Also, without the yield monitor, images taken during the growing season cannot be quantified to know how good our management strategy was. I have used the data gathered by UAS for multiple things such as showing wildlife damage in crops, seeing how far the nutrients from cow manure travel from winter feeding areas, spotting pest areas, and for management lessons on operating equipment properly. Basically, I want to gather as much data as possible so when the time comes that new software and systems have been developed I have many years of historic data to show the path forward. To be successful, agriculture and our urban cousins need to quit pointing fingers and work together. Farmers and ranchers are sustainable and we can use technology to not only prove it, but to make it better. But we need help from the business industry outside of our sandbox to create technologies and solutions centered on the vast agronomic knowledge farmers have gained from years of working and loving the land. Me with a UAV I designed and built. It is five feet long, has a nine-foot wing span, and weighs roughly seven pounds with batteries and cameras. 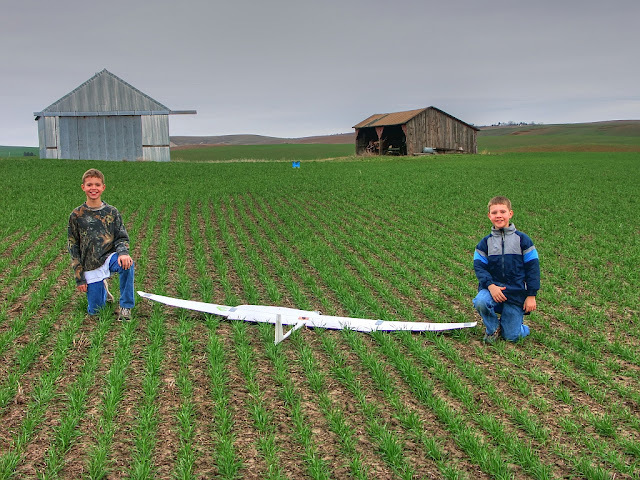 UAS is a natural evolution in agriculture’s story, and it can help our industry responsibly meet the tremendous challenge of feeding nine billion people by the year 2050. 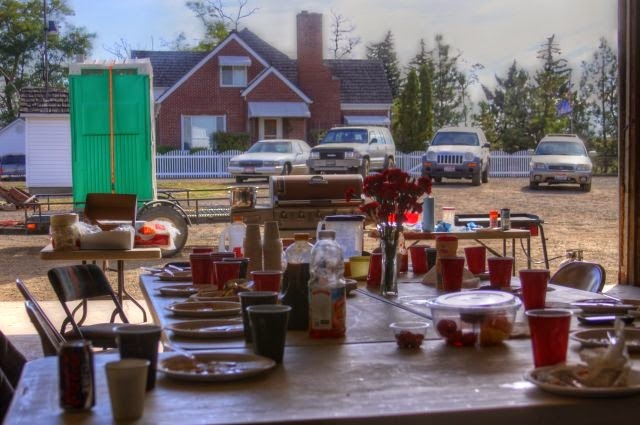 Farmland is being consumed by people to live on. Water use is becoming restricted. Resources are depleting. 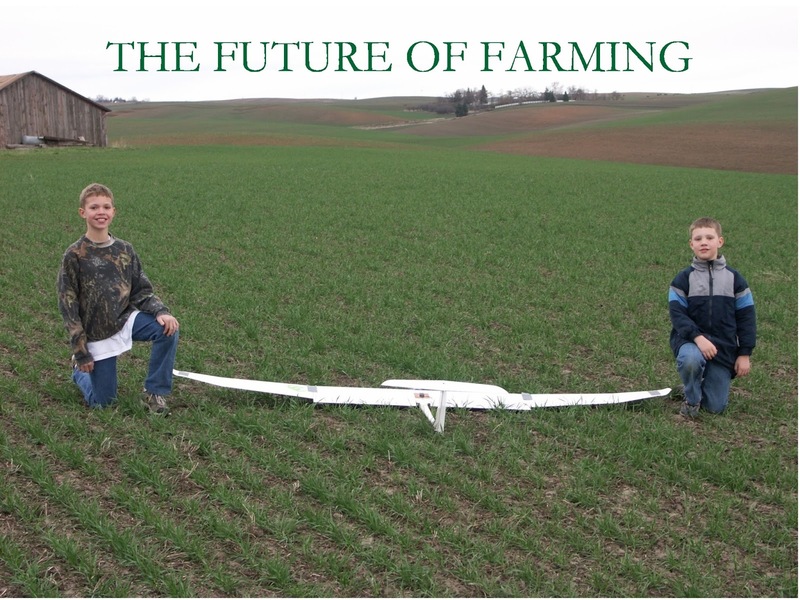 Precision Agriculture Technology and UAS will play a major role in agriculture being successful. But, we need help from outside our industry. Oh, one more thing; farmers are young at heart and just big kids still playing in the dirt…only with bigger toys and now UAS! 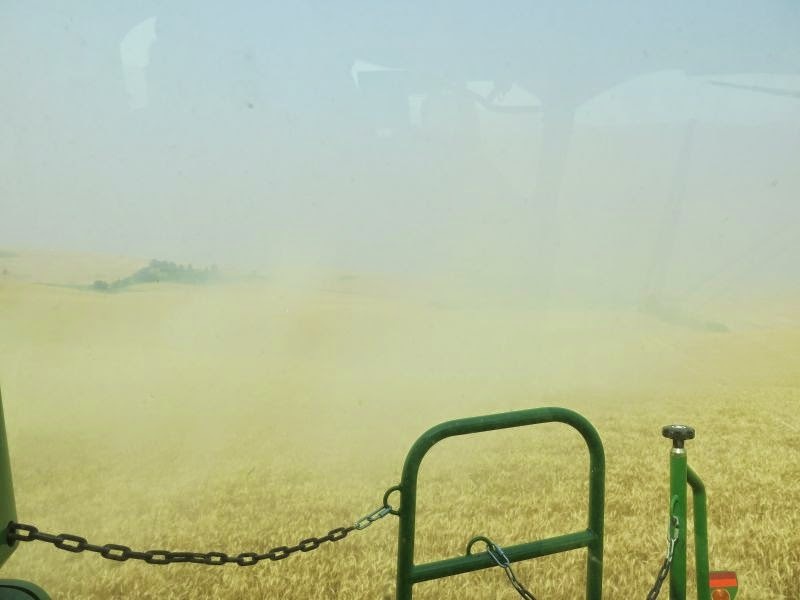 – Robert Blair is a fourth generation farmer from north central Idaho managing 1,500 dryland acres of wheat, barley, peas, lentils, chickpeas, alfalfa, and cows. 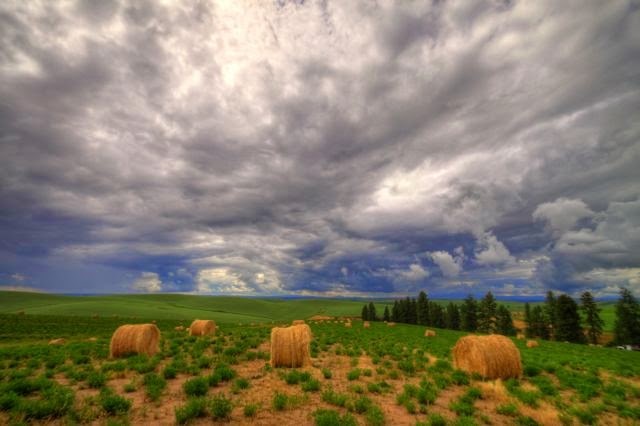 The farm is situated on the edge of the rolling hills of the Palouse and not far from his Alma Mater the University of Idaho where he received his B.S. in Agriculture Business. Robert is also the current president of the Idaho Grain Producers Association, past chairman of the National Association of Wheat Growers (NAWG) Research & Tech Committee, and chairman of the US Wheat/(NAWG) Joint Biotech Committee. Labels: Blair Farms; Three Canyon Farms; Unmanned Farmer; Precision Ag; Agriculture, drones, food, Kendrick Idaho, Robert Blair, sustainability, uav, Virgin Inc.
Agriculture is a very noble profession whose population goes unheralded and most times unnoticed. The farmers and ranchers that make up this demographic are not looking for accolades. They just want to do their job the best they know how on the land they love. In publications that I have looked at over the years, farmers and ranchers have a public trust rating of roughly eighty percent. One of the few people higher than them is their wives. The people that ensure there is plenty to eat without fear is still looked on favorably with our urban cousins. I wonder, if farmers and ranchers are so trustworthy, why don’t they have representation on different committees that are working to make rules and policy in agriculture? I didn’t either; I had to do a web search for it. It turns out that it refers to executives of companies whose title begins with a “C” such as CEO, CFO, etc. Well this seems great; farmers should be able to tell their story to the power brokers of multimillion dollar companies that can have influence on the public. However, farmers are not on the agenda! I’m sure that the 200 plus experts that were invited will be able to use their expertise to help make sensible headway into issues that agriculture is trying to deal with. I’m sure that these invited experts such as “chefs, researchers, N.G.O. (Non Government Organization) leaders, and important thinkers” will solve our problems. I wrote both a letter to the NY Times addressing this conference and sent an email to the organizers trying to figure out how solutions can be vetted without a farmer presence. In almost a month I still have no reply from either. If farmers and ranchers have about an 80% trust level with the public you would think their representation at this conference would be valued. NOPE! Not only did they develop a brand new term that farmers and ranchers will have to deal with (Agroecology) but they also designated this as “scientific” to keep real agriculture from having representation. This is an elite club of anti-agriculture-as-we-know-it club having a small get together in Rome. What’s even more interesting is the person representing the greatest force in global agriculture, the United States, is a doctor from the University of California at San Francisco. U.S. agriculture should really be pleased with our selected representative. On a topic more close to me is the absence of agriculture representation for commercial UAS (Unmanned Air Systems) members to make rules. I have been advocating for a seat at the FAA table since 2007 and there is still representation. All of this is very concerning to me and definitely should be to you! I won’t go so far as calling the lack of farmers and ranchers at agriculture meetings designed to find solutions to problems a conspiracy, but I’m close. In researching items for this article I did realize we’ve been hijacked though. Not only is the population of farmers and ranchers dwindling but our name and profession is being systematically wiped out electronically. The images of fuzzy bunnies and twitter birds flying around a Matilda looking lass holding a bunch of carrots or a John Denver-esque hippie dude in overalls and a couple of critters in the background is what you find. forefathers in being rugged and roughing it. We represent hard work and clean living. The word “resiliency” should have a picture of someone in agriculture beside it in the dictionary. However, we’ve faltered. Agriculture has turned a blind eye to standing up for ourselves. We find all kinds of excuses to why we won’t find the time to be proactive, utilize social media, and or serve as a volunteer for an organization. Yes, the world will still need food. Yes, we have the expertise to grow it well and responsibly. But do you have the backbone to demand the change to have a seat at the table that we tout so much as to filling with our commodities? It's time for you to get up so agriculture can sit! For every action taken there are consequences. Yesterday, and I’m sure more days to come, we in north central Idaho will be experiencing the consequences…POOR LAND MANAGEMENT! As you can tell by the pictures the air quality isn’t good. At harvest time there is dust in the air, usually in the evening but by morning it is cleared out. Not the case with wildfire smoke being held in by a weather system change. 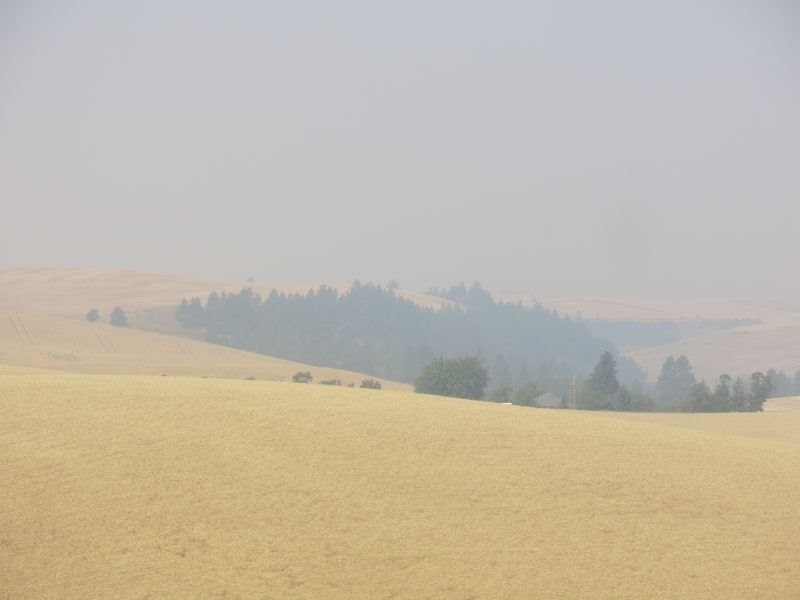 The cause for the smoke…lighting activated fires in public lands. The same public lands that are poorly mismanaged by environmental activist driven liberal policies whose demographics are in the rural regions of L.A., San Francisco, New York City, Chicago, Boston, etc. Are you getting the picture or is it too smoky to see through? For years the environmental activist organizations and zealots have preyed on the emotions of city folk to “have passion for mother earth and care for the land” by sending a $10 or more donation to stop logging. And Liberal lawmakers like Diane Feinstein are leading the charge. I wonder if she is out camping in a tent in our area to experience the fruits of her labor? By not allowing logging to take place on public lands to remove dead trees, make clearings to help stop fires, and to manage the land has made for one heck of a fuel supply that we are inhaling and will be for weeks. 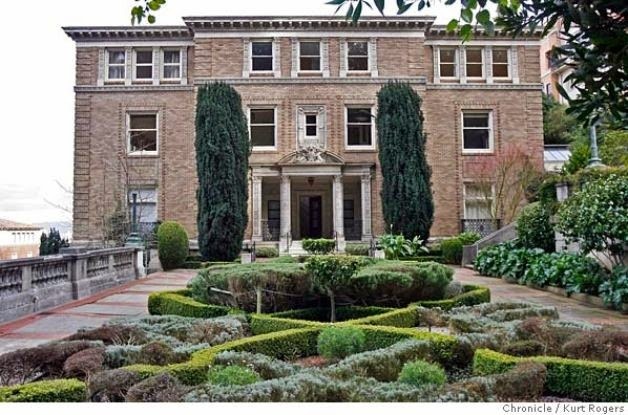 Senator Dianne Feinstein and her Husband Richard Blum have purchased a new home for 16.5 Million at the corner of Lyon and Vallejo st in San Francisco. I’m sure that Senator Feinstein, her cronies in Congress, and the liberals and activists that support these poor policies make sure that their yards are watered and beautiful. I’m sure that after the lawn is mowed and weeds are pulled the refuse doesn’t just stay there. Why is my back yard any different? Why should public lands be any different? Why can’t our government utilize the sale of the trees to help take some pressure off of us tax payers in more ways than one? The answer is definitely clearer than the smoke invested air I am seeing and breathing…BIG MONEY! Over $2 trillion is spent annually worldwide on environmental activism. Do you think these bloated back east elected officials care about me and my family in a town of 369 people in north central Idaho? Or do you think they care about the bundles of dollars their rich activist friends with townhouses in Manhattan think? Not only do we need to clear the air on this issue, but we need to clean house. We need better policies that actually work regarding public land management. We need common sense policies instead of the kind driven by activist monies. I’m sure that there is concern on the other side’s part to care for the environment and those that live in it…just not us humans that pay their way. Maybe if I was a three horned snail darter or painted lady toad strangler they would pay attention to my plea. It's down right unAmerican! Robert Blair grew up on a diverse, dryland farm in Kendrick, Idaho that overlooks the Clearwater River. He is an Ag Business major from the University of Idaho and helps to inform students and the public about precision ag and drones. He is the 2009 Precision Ag Institute's Farmer of the Year and a 2011 Eisenhower Fellow for Agriculture, 2012 McCloy Agriculture Fellow, and has received other awards for his work with drones and precision agriculture. Robert is the first farmer in the U.S. to own and use an Unmanned Air Vehicle on his farming operation. He has hosted many people and groups from around the world that want to learn first hand how this technology works at the field level. He has held leadership positions at the local, national and state levels and does many speaking engagements about precision agriculture and drones. In 2015 Robert was part of the first company in the U.S. to legally fly drones for agriculture and is the VP of Agriculture for Measure, Drones as a Service. Though he has had several titles, his favorite is Farmer. He is married and has two great boys.